Akabane Sei has problems. He’s a rakugo storyteller, specializing in comic stories designed to send his audience home laughing and feeling good. But things are not easy for a rakugoka in Meiji Japan. Audiences are dwindling as new forms of entertainment become popular. There’s even increased competition in the person of Jack Green-an Englishman who has enchanted crowds with his exotic tales of the West, such as “sailors in search of a golden sheepskin and women whose faces turned men to stone”. Complicating things further are Sei’s troubles with his wife Tae and three daughters. Shigure, an aspiring novelist, has left her husband and returned to Sei’s house. Teru has also returned home, driven from her husband not by another woman, but another man. And oldest daughter Yuri, while still remaining with her husband Kat’chan, has to come to terms with his enchantment with Christianity. Worse, Sei has lost his muse and has a bad case of ‘storyteller’s block’. He needs new material but can’t seem to think of a single thing. What could help bring him out of his midlife crisis? When Sei is approached by the Black Ocean, a secret society devoted to upholding the ‘traditions of the past’, it seems that this might be the key to his professional resurrection. But after being ‘encouraged’ to write a story dealing with Korea that will reinforce the imperialist goals of the Black Ocean, he instead falls afoul of the group after penning “The History of a Nose”. Based on an obscure account written by a 16th century monk, it has the opposite effect and could have a disastrous effect on Sei’s career-not to mention his very life. 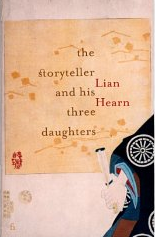 Sei is the title character of bestselling author Lian Hearn’s new book, “The Storyteller and His Three Daughters”. Hearn, best known for her “Tales of the Otori” series, has recently turned to tales set in the real-life Japan of the 19th century. “The Storyteller” blends a simple story of family with a look at the early stages of colonialism in the Japanese government. 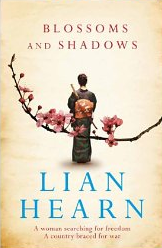 Hearn uses her fictional family along with characters such as Jack Green and Sei’s other acquaintances to explore Japan’s transformation from the days of the Tokugawa Shogunate to a modern, industrialized nation-and its increasingly warlike stance. The main storyline revolves around the shadow group Black Ocean (an actual historical organization) as it attempts to coerce Sei to produce propaganda that will support their agenda of invading Korea. One of its leaders, former samurai Yamagishi Takayuki, attempts to coerce Sei to write stories that depict Korea in a negative light in order to sway public opinion towards an invasion. Sei, deep in debt, at first reluctantly feels obliged to comply when Takayuki settles his debts. But a chance encounter in a bookstore with the memoirs of a monk, Keinen, gives Sei pause to reconsider. Keinen historically accompanied Toyotomi Hideyoshi’s invasion of Korea in the 1590’s and bore witness to any number of horrors. He likened the slaughter in Korea to the Buddhist Realm of Beasts, and recorded his observations of the atrocities. The spirit of Keinen seems to haunt Sei, tormenting him with visions of carnage and mutilation. The day of the O-bon festival (the festival where the Japanese honor the spirits of the dead) sees Keinen at his most powerful, seemingly calling down the wrath of heaven upon the land and punctuating his abuse of Sei with an earthquake. Is the spirit of Keinen real, or is he just a manifestation of Sei’s conscience? It’s never made clear, but the manuscript mysteriously disappears after Sei decides to reconsider. Instead of an anti-Korean tale, he performs ‘The History of a Nose’, a reference to the thousands of noses cut from slaughtered Koreans during Hideyoshi’s invasion. Rather than a comedic tale written to depict Korea in a negative light, it instead dwells on the horrors of war as related by one of the noses in Kyoto’s Mimizuka (the misnamed ‘ear mound’, which actually contains the noses collected by the samurai invaders during the Korean invasion of the 1590’s). Sei’s story chills his audience and infuriates the Black Ocean. Their influence sees him banned from rakugo and his life is now at risk. Can a man armed only with words prevail against a group more than willing to assassinate its enemies? If this was one of Sei’s stories, he might see his role as the badger against Takayuki’s tiger. And after several more twists, the badger sets out to confront the tiger in its lair. The adventures of Sei’s daughters bring other cultural issues of the day into the storyline. Shigure doesn’t care about a woman’s traditional role and only wants to pursue her career as a novelist. Teru, who takes up Western style knitting as a moneymaking venture, only wants to please her husband but is at a loss as to how. Yuri’s stable relationship is threatened by her husband’s religious awakening. The elimination of the ban on Christianity, the birth of the women’s rights movement in Japan, the colonization of the northern island of Ezo/Hokkaido, and sexual roles in the changing times (if indeed it changed at all) are all examined in the story on a personal level where the effects of national issues on an individual can be seen. In an amusing scene, there’s even what could be called an example of early cosplay at work! Other characters serve the same function, such as Okuda Satoshi. A scholar of all things France, he runs into trouble with the government for his anti-warfare stance as part of the People’s Rights movement and is imprisoned. There’s also a stunningly handsome Korean stagehand, Kyu, that becomes an integral part of the Black Ocean’s schemes and who may become the focus of anti-Korean sentiment. The English storyteller Jack Green serves as the symbolic embodiment of the Western invasion of Japanese culture-and also how the Japanese were able to absorb it into that culture while maintaining much of the old ways. He also provides a character that Western audiences can use as their entry into Sei’s world. Jack becomes an important character in Sei’s life, far and beyond his effect on Sei’s professional career. A man who initially aroused only jealousy and anger in Sei becomes an important ally, and perhaps a friend. From this tapestry of events, Sei draws the inspiration for the work he is to become most famous for-“The Silk Kimono”. In the world of “The Storyteller”, life doesn’t simply imitate art, it becomes art. Hearn uses an interesting writing technique that she learned from researching early Meiji period novels. Many of these novels would present conversations between characters in a format similar to a stage play (or a modern-day film script). Her protagonist Sei uses this method to record his personal conversations. It’s an interesting departure from the traditional Western novel, giving it a ‘period feel’ that adds to the reader’s immersion into the culture of the times. In this way it’s much like Royall Tyler’s recent translation of the “Heike Monogatari (The Tale of the Heike)” where he renders the text much as it would have been narrated by a biwa hoshi (blind lute priests that performed the Heike for audiences). In “The Storyteller”, it also has the effect of drawing the reader into the story. Readers become silent participants in his conversations, giving them a sense of immediacy and realism. 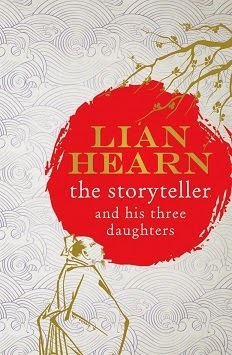 In our opinion, Hearn writes the best researched, most accurate Japanese historical fiction to be had. Her previous book, “Blossoms and Shadows”, is the last word in historical fiction dealing with Japan (and one of its characters-medical student Itasaki Michi-is a major character in “The Storyteller”). It was a masterpiece of blending fiction and fact. The level of research and her ability to weave it into the threads of her storyline was unsurpassed, and she’s brought the same approach to “The Storyteller”. However, “The Storyteller” is a far more accessible tale, not requiring the level of Japanese historical knowledge from the reader that “Blossoms” at times did. Here the history tends to confine itself to cultural details and the day to day life of the characters rather than the major events of the day, blending in unobtrusively with the story but infusing it with a sense of authenticity. She also works in several classical rakugo tales as well as some of her own. It also alludes to the assassination of the Korean Empress Myeongseon in 1895 and an obscure but delightful theory that the Meiji Emperor was not the son of Emperor Komei but a substitute. But Hearn gives it a light touch, never allowing the historical connections to draw attention from the story. While historical accuracy can greatly enhance any work of fiction, the real test is whether it provides an engaging tale with characters the reader can become invested in. And here “The Storyteller” excels. Sei is a character that the reader can easily identify with. He has the same sort of financial, professional, and family problems that we experience 130 years later. He’s hardly the perfect hero, lying, running up debts, ignoring his wife, and in general acting a lot like a real human being. But underlying it all is his deep sense of sincerity and real affection for his loved ones. Sei even marches into the den of the tiger, risking his life to come to the aid of a helpless friend. When all is said and done, Sei does not sell out his art and integrity, and helps his family see their various crises through-albeit at times with some very non-traditional solutions! It’s a lovely story where you can feel the conflicts, the worries, and the joy of a cast of diverse and well thought-out characters. 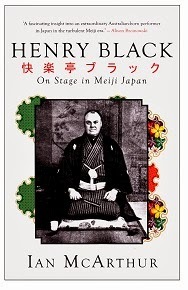 An interesting non-fiction companion piece to read in conjunction with “The Storyteller” is Ian McArthur’s new book “Henry Black: On Stage in Meiji Japan”. Black was Hearn’s inspiration for the Jack Green character in “The Storyteller”, and both Hearn and McArthur discovered Black while reading an article on him in Monumenta Nipponica (they’ve also appeared together to co-promote their books). Black was an Australian national who lived in Japan from the time he was three in 1861. Unlike many Westerners in the Meiji period who had little interest in learning Japanese culture, Black embraced it, eventually becoming the first foreign-born Kabuki actor and rakugoka. He specialized in telling Western tales adapted for his Japanese audience. Black was fluent in spoken Japanese, married a Japanese woman and eventually became a Japanese citizen. He lived a fascinating, sometimes tragic life. McArthur’s book will not only enhance your enjoyment of “The Storyteller” but provide a great read on its own. “The Storyteller and His Three Daughters” manages to combine a story of intrigue and national issues with a simple tale of a family’s love and the bonds between them. It provides a microcosm of how Japan dealt with the rapidly changing times of the Meiji period. There aren’t any ninja, huge pitched battles, or scenes of mass conflict-just the simple moral dilemma of the badger facing the jaws of the tiger. When Sei ends his story with the traditional rakugo ending of “And now I leave you in the capable hands of the next story”, one only wants to hear that next story. We hope that Lian Hearn will oblige. “The Storyteller and His Three Daughters” is available for Kindle through Amazon HERE, or get a copy of the Australian print version HERE. You can download an excerpt HERE. The Kindle format has several advantages over a print version, the most important of which is that it can be updated with new content. In this case, Hearn has expanded the historical notes and added contemporary photographs and artwork. The Kindle version also has a new and more interesting cover. One of the nice things is that you don’t actually need a Kindle to read the story-there are free Kindle Reader apps for PC, Mac, Android, and IPhone/IPad so virtually any electronic device with access to the net can be used. Hi there, I'm the publisher of the international electronic edition of The Storyteller and his Three Daughters and we very much appreciate your review and your mention of the additional features of the electronic edition. Your readers may be interested to know that the book is available not only from the Amazon Kindle stores in various territories, but also from the Apple iBookstore, the Kobo Store and direct from the Ligature Bookshop. You can buy the book from your favourite electronic outlet by clicking here. Thanks for such a thoughtful and detailed review.